Please click below to download PDFs of our menus. Most menu items and pizzas are available for carry out. Please call the restaurant to place your order. Please note that prices, selections, and availability are subject to change. Host dinner or a cocktail party for your friends and family in our private room or enjoy a formal dinner with cocktail hour prior to dinner. Our Private space is perfect for showers, weddings, and any special celebration. We offer a standard 3 or 4 course lunch and dinner menu for your event. These packages include bread, fountain drinks, iced tea, and brewed coffee. Additionally, we can create a custom dining package that fits your budget. All events designated as private will require a food & beverage minimum for use of the space. 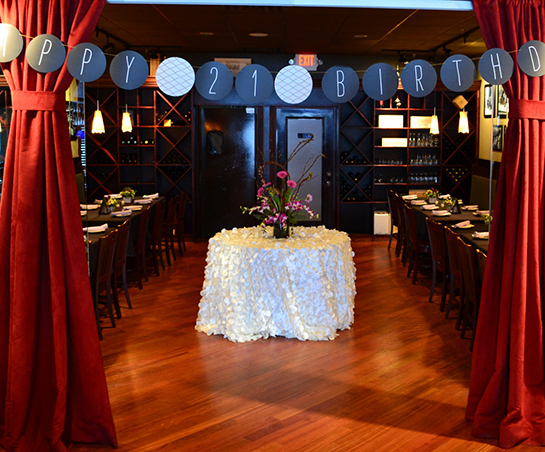 We would be happy to customize a menu or event package. Contact an event coordinator to reserve a time.